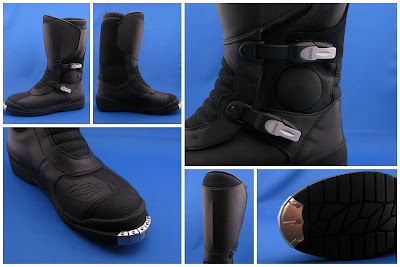 I had been on the look out for a new pair of motorcycle boots for a while as my current boots were 10+ years old and had somewhere beyond 50,000 miles on them. I had a few requirements, first was Gortex lining, or equivalent. Second was to be a bit more off road worthy with out being full-on MX boots. Three different boots readily fit my requirements, Sidi Discovery Rain Boots ($325), Gaerne Balance Oiled Boots ($360), and BMW Santiago Boots ($360). All three boots had waterproof linings. 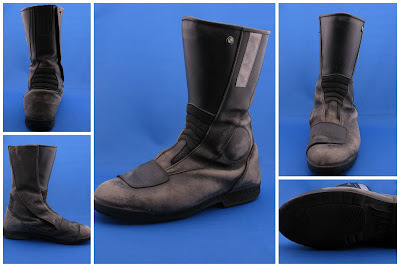 The Sidi and Gaerne boots had three buckles and external plastic shin guards, while the BMW boots only had buckles above and below the ankle and Velcro closures at the top. The BMW also has a plastic shin guard, but its laminated between the outer leather and inner lining. The Sidi boots were leading the pack mainly for the price and the positive comments about them on advrider.com, but in the end it was the BMW boots that won out. 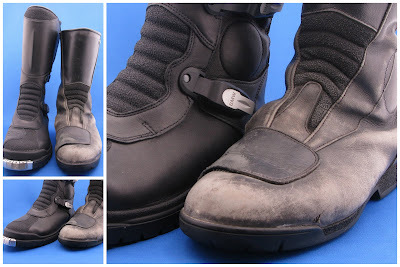 I had had a good experience with my BMW boots over the past 10 years, no leaks and comfortable. The Kicker was the final price, do to some savvy shopping and timing I, em Santa was able to purchase the BMW Boots for only $235 plus tax. A deal that I couldn't pass up, I paid more 10 years ago for the boots I'm retiring. Because I signed up on the BMW XPLOR site I got a $100 off BMW apparel over $300 and my dealer was having a 10% off holiday sale, hence the price I couldn't pass-up. Some of the features of the Santiago Boots include two adjustable buckles one above and one below the ankle. There is a metal cap on the front of the sole that is replaceable. The toes of each boot have a rubberized coating and the left boot has a extra layer for the shifter. There are hard panels over each ankle and shin with corresponding padding underneath. So far my experience with the new boots have been some adventure vacuuming (to which they might be overqualified, the jury is still out) and a short trip to the gas station (45 min trip to the 1 mile away gas station). I will try and post an update after I put a few more miles on them, hopefully they will holdup as well as the boots I'm retiring. Photos are of new and old for comparison. 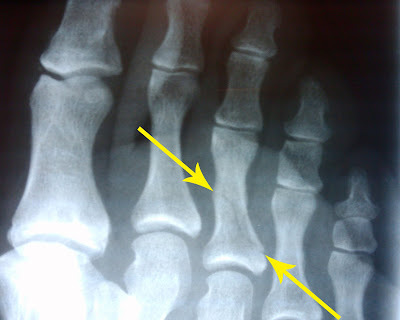 First phalanges non-displaced fracture of the third digit. Other wise known as a broken toe. As with the last broken bone I acquired, there isn't much to be done with a broken toe, except to add a little wobble to your walk. At this point you have to be asking your self how in the world does somebody break a toe? What progression of failures must occur for a toe to be broken? 1. 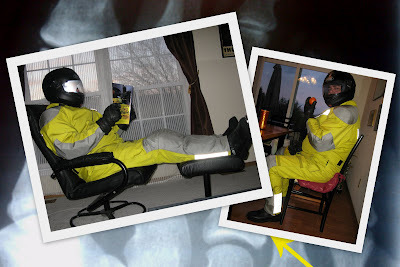 Not wearing the proper protective gear. 2. Lack of situational awareness. In-fact when my right 3rd digit slammed into the corner of the stair case, I was neither wearing the proper protective gear nor situationally aware of my surroundings. I believe I was wearing a pair of socks and my skives. I was also attempting to walk and talk at he same time, and everybody know that in it's self is a most dangerous activity that should be avoided at all cost. Since that fateful moment one week ago I have vowed to fully embrace ATGATT. My family on the other hand think I might be going off the deep end. Eating, sleeping or just lounging around the house it's ATGATT!